Here's a clean and simple card inspired by the sketch challenge over at Less is More. This is great. I love the twine and the red/white/blue colour scheme. Super card! This is a super interpretation of the sketch which would be perfect for anyone... including those difficult to cater for people... men! That is just so cool, very creative design! Love the angle design of your card and the twine wrapped around is really cool - great card! What an amazing take on the sketch. That nautical feel is so fresh and funky. A terrific card. 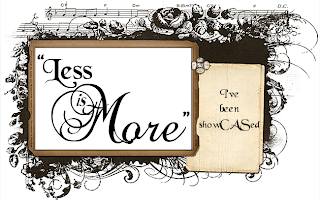 Thanks for sharing this with us at Less is More. What a fun card! Cool ideas in it! What a fun card - I love the twine around your lifesaver and your bright, primary colours. A great LIM card! Love nautical shades and what a super take on our sketch!